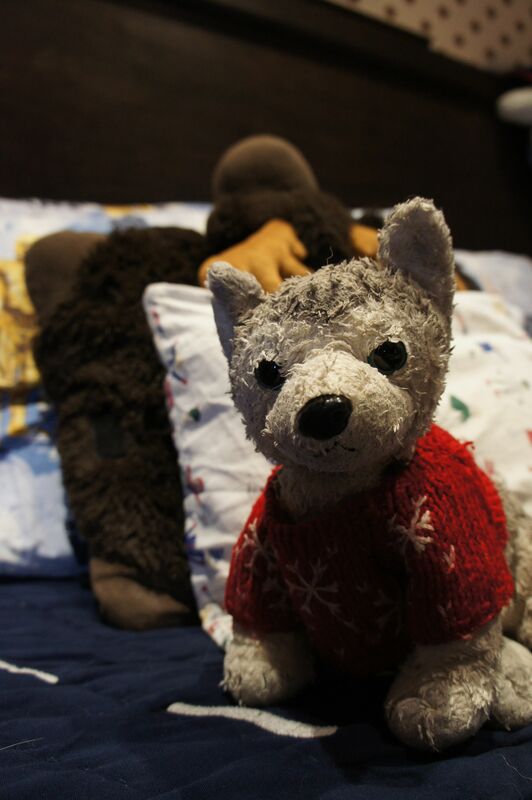 Love conveyed: a well-loved plushie atop a well-made bed. Three minutes – that’s about all it takes to make a bed (provided you’re not one of those really fancy dancy people whose decor includes twenty decorator pillows, a spread, a fur throw and a ladder.). Depending on your perspective, those are three minutes you can use to do something else more meaningful or, if you’re like me, you’ll use those three minutes to make the beds in your home, just about every morning. The main argument against bedmaking seems to be, “why bother making something you’re just going to mess up later in the day?” And yes, I agree, from a purely logical standpoint this makes sense. Why bother indeed? But for me, the effort it takes to make a bed is far outweighed by the psychological benefits a made bed offers. Think about it for a second: regardless what chaotic state a room is in, a made bed suggests a sense of care and order. A made bed connotes a level of effort that goes beyond the status quo. A made bed indicates someone thinks it (and the person who sleeps in that bed) matters. Years ago, in the earlier days of this country, immigrants didn’t rent rooms so much as they rented beds. After laboring for so many hours in the day, they’d return to the boarding house just in time to hop into the bed still warmed from the previous occupant. Clearly there was no time (or need) for hospital corners. Today, we’re busier than ever before, with many more riches than our early immigrants could have ever anticipated. The morning ritual of making a bed may seem somewhat antiquated, or viewed as an unadulterated sign of a true control freak. And yes, I suppose that’s hard to argue with. But for me the small gesture of taking some time to bring the tiniest bit of order into an insanely unruly life is time well spent. And, after all, it only takes three minutes. This entry was posted in Is it just me..., Parenting and tagged bed making, love = a made bed, morning rituals. Bookmark the permalink. I’m with you. I think a unmade bed makes the bedroom look so much sloppier.